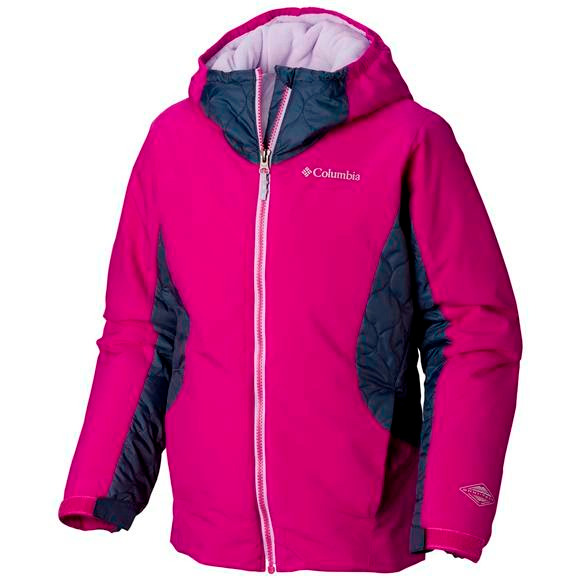 This full-featured Columbia Girl's Youth Wild Child™ ski jacket is built for shredding in all kinds of weather. Crafted of a waterproof-breathable material with thermal reflective liner to help regulate body heat. Packed with 150g of synthetic down insulation for maximum warmth. Featuring an adjustable, helmet-compatible hood, a powder skirt with silicone grippers, and a handy ski-pass pocket. This full-featured Columbia Girl&apos;s Youth Wild Child™ ski jacket is built for shredding in all kinds of weather. Crafted of a waterproof-breathable material with thermal reflective liner to help regulate body heat. Packed with 150g of synthetic down insulation for maximum warmth. Featuring an adjustable, helmet-compatible hood, a powder skirt with silicone grippers, and a handy ski-pass pocket. Excellent value for a quality product. Daughter said kept her warm when skiing.